Edward A. Reid, Jr. has fifty years of experience in the energy industry in technical research and development, market development, marketing and consulting. He writes frequently on climate science. The recent report by the National Association of Scholars, The Irreproducibility Crisis of Modern Science, describes a crisis which pervades modern science in general. It refers only peripherally to issues with climate science, which shares most of the aspects of the broad crisis, but has its own distinctive issues as well. Albert Einstein is alleged to have defined insanity as continuing to do the same things and expecting different results. He might perhaps have defined irreproducibility as continuing to do the same things and achieving different results. The earth’s climate is a constantly changing, extremely complex chaotic system, driven by the sun and influenced by numerous external factors including the positions of the other planets in the solar system and cosmic radiation. Many of the factors which influence climate are not well understood. Therefore, while it is reasonable to assume that human activities can influence climate, it is not reasonable to assume that humans could effectively control a complex, chaotic system they do not understand. Modern climate science focuses on three primary issues: changes in land and ocean temperatures; changes in sea level; and, efforts to model the future of those changes. The climate science community is perceived to have formed a consensus that human emissions of “greenhouse gases”, such as carbon dioxide and methane, into the atmosphere are driving climate change which is manifesting as increased near-surface and ocean temperatures, causing rising sea levels and ultimately leading to a climate catastrophe. This consensus is viewed as climate orthodoxy and is aggressively defended by the orthodox climate science community. Those who question the orthodoxy have been labeled “deniers” and “anti-science”; and, efforts have been made to prevent publication of their work in major scientific journals and to exclude their work from the reports of the Intergovernmental Panel on Climate Change (IPCC). One member of the orthodox climate science community even expressed a willingness to destroy data, rather than make it available to a team questioning the statistical techniques used to analyze the data. The approach to measuring and tracking changes in near-surface temperatures is fraught with issues. The instruments used to measure near-surface temperature are acknowledged to be in error by an average of more than 2°C in the United States, where the instrument sites have been surveyed and rated. It is reasonable to assume that the instruments located in other nations have similar issues. Therefore, these temperature data are “adjusted” in an effort to resolve the errors. However, once “adjusted”, the temperatures are no longer data, but merely estimates of what the data might have been, had they been collected timely from properly selected, calibrated, sited, installed and maintained instruments. Unfortunately, there is a history of multiple adjustments to the temperature anomalies over time. 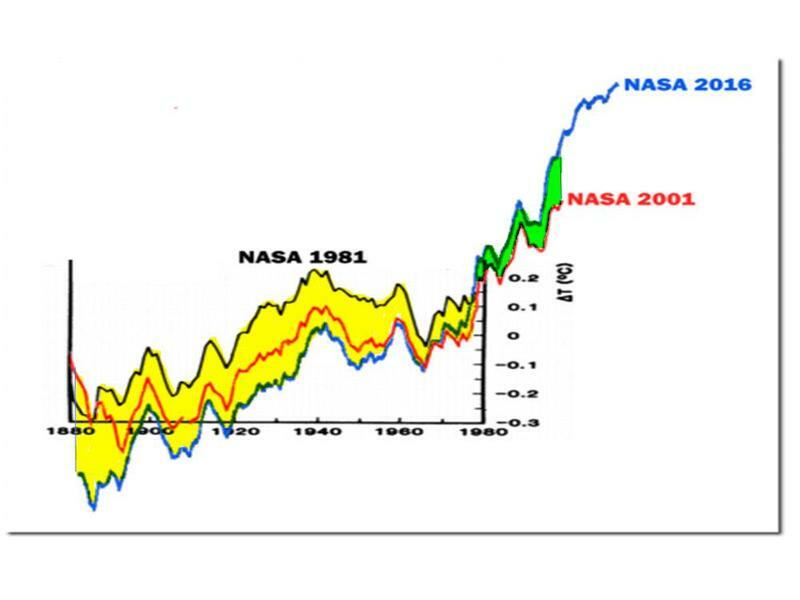 The graph below displays two instances of “adjustments” to, or “re-analysis” of, the global temperature record made by NASA GISS. The climate over the period from 1880 to 1980 and its actual anomaly from the reference period did not change. However, the reported anomaly over the period did change. The anomaly was reduced by as much as ~0.2°C early in the period, thus increasing the apparent rate of increase of the anomaly over the period, as shown in the area highlighted in yellow in the graph. 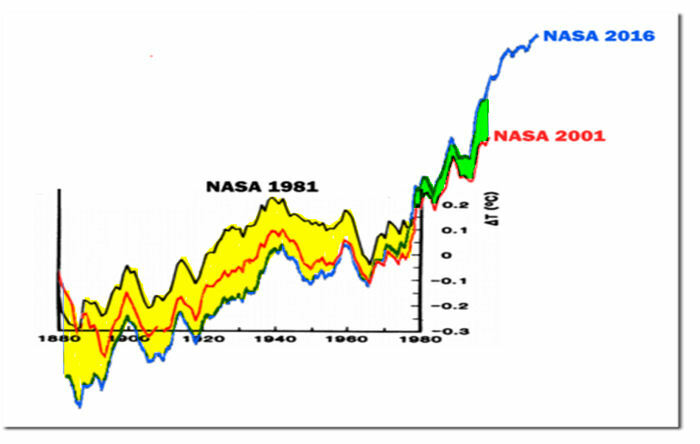 The climate over the period from 1980 to 2001 and its actual anomaly from the reference period also did not change. However, the reported anomaly over the period did change. The anomaly was increased by as much as 0.2°C late in the period, as shown in the area highlighted in green in the graph, again increasing the apparent rate of increase of the anomaly over the period. We cannot determine from the information in the graph the number of times the anomalies were “adjusted” or “re-analyzed”. We can only determine the cumulative effects of the “adjustments” or “re-analyses”, which appear to total ~0.4°C, or approximately 1/3 of the reported anomaly change over the entire 136 year period. We do not know which, if any, of the anomaly plots contained in this graph is accurate. We do know, however, that they cannot all be accurate. A generous assessment of the differing anomaly plots of the ‘adjusted” temperatures shown in the graph above might be that NASA GISS has an internal irreproducibility issue. There are also less generous assessments. • verifying a climate model which actually models the real climate. The orthodox climate science community has been very quick to accept the satellite-based sea level rise measurements, which are approximately twice the measurements produced by the surface-based instruments. However, they have so far been reluctant to accept the satellite-based temperature measurements, which typically show smaller anomalies than the near-surface temperature measurements. In the face of these unresolved issues, the US government and other national governments and funding sources have squandered massive funding on studies using unverified models, uncertain climate sensitivities and ill-defined climate forcings and feedbacks, combined with the most aggressive Representative Concentration Pathway in the IPCC studies (RCP8.5) to produce “scary scenarios” of future climate catastrophes. These studies have no apparent scientific value. They are intended solely to scare the populace into accepting the climate orthodoxy and the actions identified as essential to avoid the “scary scenarios”. • NASA Goddard Institute of Space Studies Director Gavin Schmidt has voiced support for more climate research transparency. These developments might lead to a refocusing of climate science funding on resolving the major issues facing climate science, rather than on the creation of model-driven “scary scenarios”. Thank you for visiting https://www.therightinsight.org:443/Irreproducibility-and-Climate-Science! Be sure and revisit therightinsight.org frequently for content updates and more.